Diane Miessler: C’mon, can you really grow tomatoes from seed? 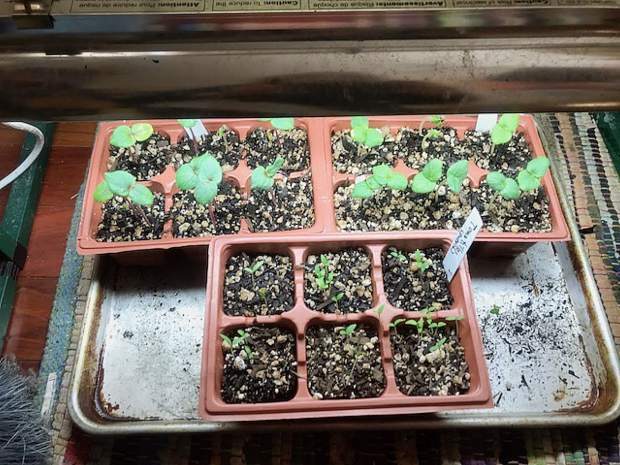 Diane Miessler has found the best way to start seeds is to put plant "six-packs" on a cookie sheet and place them in the oven for one minute. She periodically turns on the oven for one minute at a time to keep the seends warm but not hot. When the surface is dry she waters the seeds with warm water. OUTSIDE: I’m planting a thicket of pink cosmos amidst the iris near the street, because they’ll fill in when the iris start to look ratty, and because they’re showstoppers when they bloom. And I’m planting nasturtiums in my blueberry/asparagus bed. I plant everything with everything, for a few reasons: 1) I happen to be a little chaotic. I can admit this. 2) It makes edible gardens beautiful and beautiful gardens edible, and 3) Biodiversity rocks. Diverse plantings enrich the soil by attracting a greater variety of soil food web inhabitants, and protect plants from disease and predators. INDOORS: I’m starting seeds for tomatoes, about two months before planting time. Seeds started now will be ready to go about when Mother Nature is ready to not freeze them — around Memorial Day. Don’t let warm spring days fool you — frosts can come late in these parts. I dip used six-section “pony packs” in a 1/10 bleach solution to be sure they’re not carrying any damping-off germs; I do this because baby seedlings are so vulnerable, and damping-off — where seedlings just keel over dead with a little rotten spot where the stem meets the dirt — breaks my heart. I let the pony packs air dry after dipping. For the same reason, I use sterile seed starting mix — this can be bought by that name, or you can use some combination of potting soil, coir fiber and perlite. The important thing is that it holds water and also drains quickly. The best way I’ve found to start seeds is by putting the 6-packs on a cookie sheet, for ease of relocation, and putting them in the oven that I’ve turned on for 1 minute — kind of like raising bread dough. When I’m home I turn the oven on for 1 minute whenever I think of it, to keep it warm but not hot. When the soil surface looks dry, I water with very warm water from a small watering can with a “shower” type nozzle. 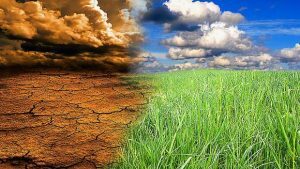 Warmth stimulates seed sprouting. Once most of the seeds have sprouted, they’ll want a cool, bright location, which makes for sturdy little plants. I use a fluorescent grow light that can be easily raised and lowered; this should be a couple inches above the tops of the plants. Because seedlings need a rest period, I let them sleep when I do — turn the light on when I get up and off when I go to bed. The cool location helps keep them from getting gangly. On warm, sunny days, I take them out for a little fresh air; the cookie sheet makes them easy to move. Just remember to bring them inside in cold weather. This is known as “hardening off:” gradually toughening up the seedlings until they can grow outside. Once they’ve sprouted, I water from the bottom, to prevent damping-off; the cookie sheet makes this easy. After about a month, when the seedlings have at least one set of real leaves and the roots have spread throughout the soil they’re in, I transplant the seedlings to 4 inch pots. You can reuse any you have, or you can make them out of a sheet of newspaper, folded more or less the way you would to make a little boat. Google ”YouTube DIY: newspaper pots” — it’s a wonderful way to get lots of 4 inch pots in a hurry, for free. Plant seedlings a little deeper than they grew, covering the lowest set of leaves; the part you bury becomes a productive part of the root system. Water the newly-repotted seedlings well and keep them in a cool place for a day, to let them recover from the insult of transplanting. Continue the hardening-off process until around Memorial Day, when you can plant them outside. Tomatoes planted earlier, in cooler weather, have no advantage over those kept inside until warmer weather; they pretty much just sit there and sulk in the cold anyway, then are outpaced by their more coddled brethren. And sistren. And they might freeze if the weather turns on you. Then sit back and watch your plants explode with tomatoes. Figuratively. And eventually. Growing tomatoes requires some patience but, as anyone who’s compared homegrown to bought knows, it’s worth the wait.